Specifically, animals that received the targeted cocktail had a left ventricular ejection fraction, which measures a heart's functionality, of around 67 percent four weeks after the heart attack – which is healthy. The tPA by itself was around 57 percent, which is at the low end of the normal range, while both the control group and Y-27632 by itself dipped into the 40s. Similarly, the targeted cocktail resulted in scar tissue across less than 5 percent of the affected area. The tPA and Y-27632 had scar tissue across approximately 7 percent of the area, with the control group seeing scarring across more than 10 percent. 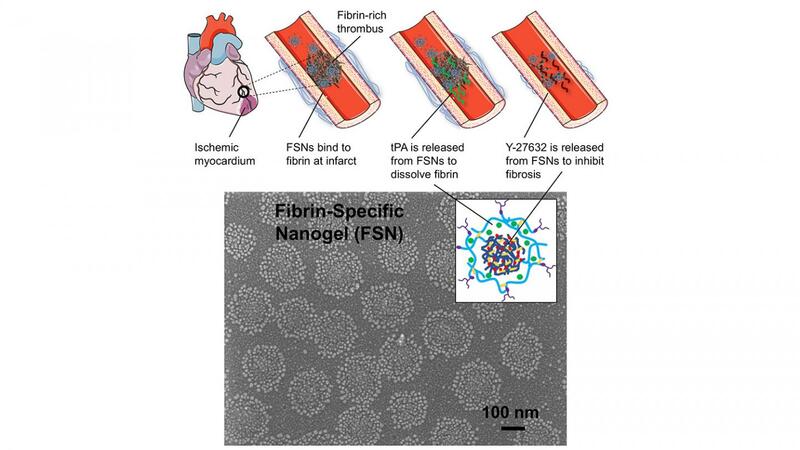 What's more, the researchers found that the targeted nanogels resulted in little or none of the nanogels being found in other tissues – such as the lungs and liver – particularly when compared to the use of the non-targeted nanogels. "While we are still in the early stages of developing this technology, we know that it's important to acknowledge issues related to cost," Brown says. "Given the complexity of the drug delivery system, it should be comparable to or slightly more expensive than recombinant protein therapeutics currently in clinical use – such as tPA by itself. However, because the drugs are targeted, the doses are likely to be smaller. That should help to keep the costs comparable to existing drugs on the market."